I've always been a fan of heavy makeup looks. Give me a smokey eye, full coverage foundation, and winged liner any day. Yet, I'm also on the other side of the spectrum with appreciating a more natural look. This didn't use to be the case even 5 years ago, I've always felt more comfortable and 'me' with a full face of makeup (weird, I know). Since I've invested more in skincare, I've tried to cut back on caking it on so much. I've really been focusing on getting my skin to a good place where I can wear lighter coverage. lilah b. is a luxury brand that's been on my radar for quite some time now. They focus on a simplistic and minimalist look when it comes to beauty by using fewer products, with a concept of 'with less, you are more.' Cheryl Yannotti Foland, the founder of lilah b., drew inspiration from her new healthier lifestyle after moving from New York to Northern California. 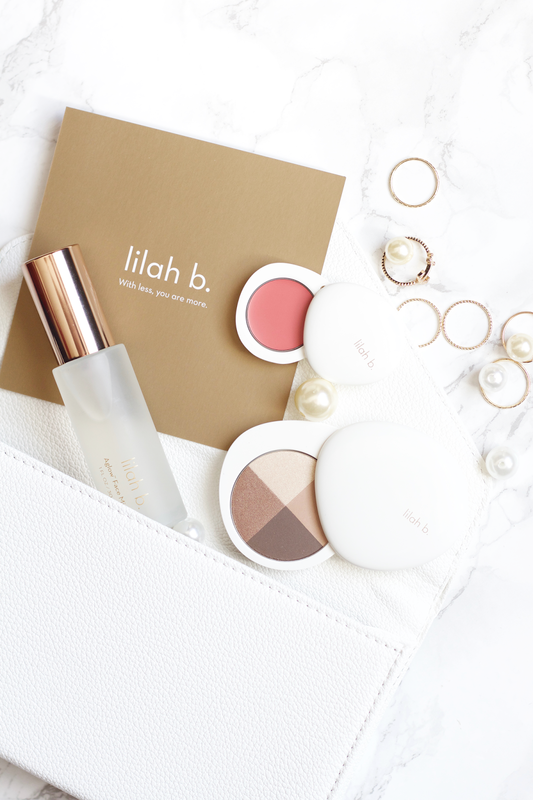 She created lilah b. as a "luxury minimalistic collection of color for a simplified beauty routine." lilah b. has a very unique charm and characteristic that is so organic, everything is so effortless. The stone packaging aesthetic creates a very chic look that adds to the sophistication of the products and overall high quality of the brand. I love that they feel and look so luxurious and classy. What's even better about these products are their formulations. They are combined with nourishing and moisturizing botanical ingredients, and are free of parabens, phthalates, sulfates, and synthetic ingredients. They are a vegan friendly brand and are cruelty free. For the holidays they came out with their b. unique Set*, which allows you to choose three pieces from their permanent line as a product combination. Their holiday set retails for $152 and comes with a complimentary white vegan makeup bag/clutch. You are not saving money buying the set versus buying the products individually but you are getting the free makeup/clutch with it. This is a beautiful set and I'm in love with the clutch, it's so gorgeous. This set is only customizable on their website, but they are available to buy on Net-A-Porter, Barneys, and Neiman Marcus already customized. I was really happy to see an eyeshadow palette included in the package I received from lilah b.! I've been wanting to try their eyeshadow palettes and this one especially stood out to me. This is described as a long-wearing, buildable, and blendable palette that offers subtle to bold looks with wet or dry application. 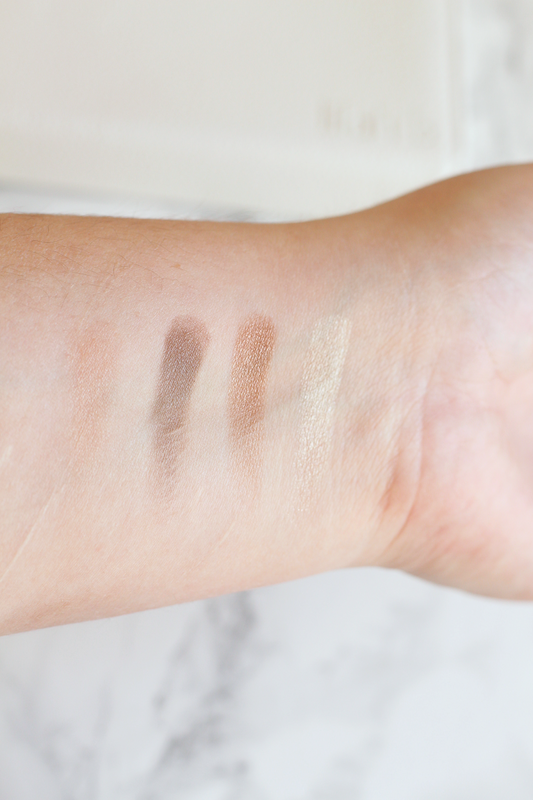 It has both matte and shimmer eyeshadows: a light warm camel brown matte transition shade, a cool darker brown matte smoke shade, a light warm cream champagne shimmer shade, and a light copper shimmer shade. The thing I find interesting about this palette is the colors shown in the pan don't transfer as the same in the swatch. I thought I would see more of a light copper shade in the far left corner but it ends up looking a bit of a mixture of bronze and copper. The dark brown looks deeper in the pan but it actually isn't that dark at all. This really shows the simplicity in lilah b. 's aesthetic as a brand, by staying true to a very minimalist style. 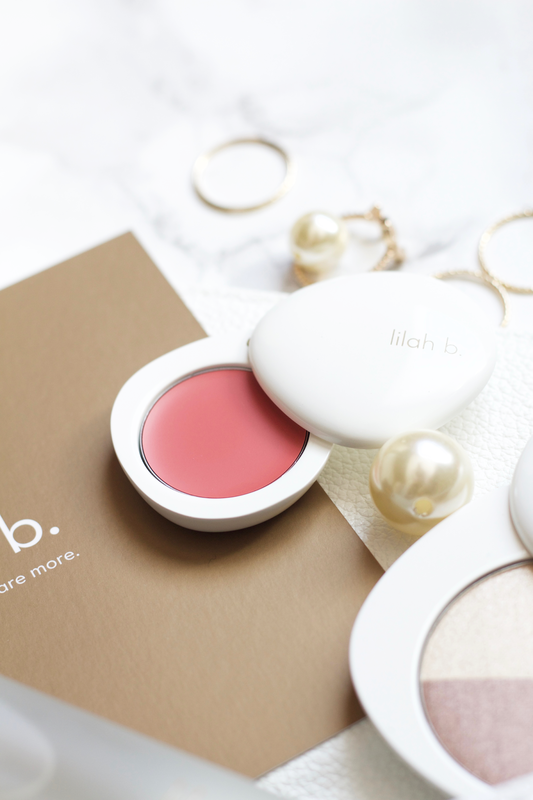 I think lilah b. as a brand is for the kind of person who enjoys aesthetics like Bobbi Brown, etc. The palette has beautiful colors, especially the shimmer shades (the champagne cream color is wonderful as a highlight and on the lid!). 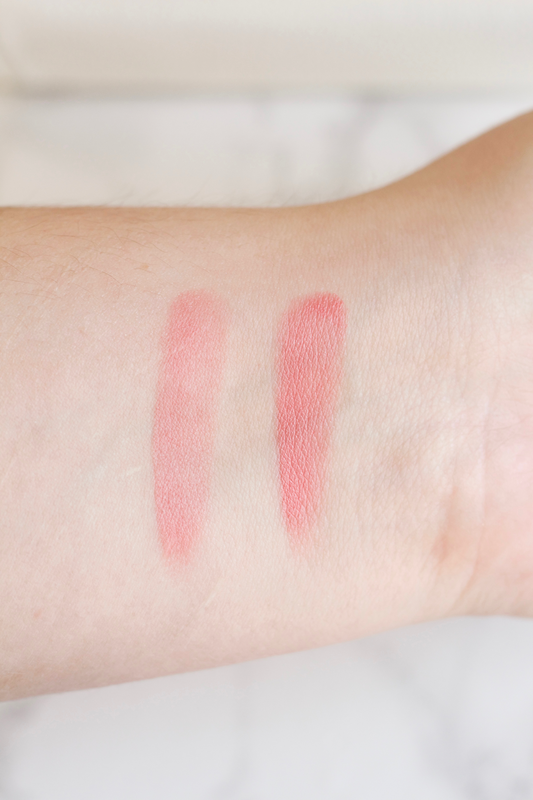 The mattes applied very soft and I had no trouble blending them out. I found that these were easier to use with my brush that they were swatching with my fingers. Focusing on the palette and how it performed, I will say that these are buildable opaque colors. Unless you layer these a few times, they will have a very soft look. They are very complimentary colors and you can create both a natural and dramatic look from them. I do, however, also want to bring attention to the fact that these might not show up too well on darker skin tones. On lighter skin tones like mine it will be easier to get away with less pigmentation, but darker skin tones might have a harder time getting these shades to work. Divine Duo Lip & Cheek is a creamy, long-wearing, and moisturizing product that provides healthy, buildable color. It comes in eight shades, ranging from a deep red to a bright orange. b. true is described as a mauve/pink on the website but I would rather say it's a bright coral. On my skin tone it comes off super red toned, very in line with my natural red pigmentation, which put me off at first. I buffed it in using my Teri Miyahira 05 synthetic brush and it blended really well to look like a natural flush on my cheeks. I'm so in love with these pebble shapes, it's so chic and the slide openings are really so classy. They are magnetic and very sturdy, so they won't easily come open if you happen to take them with you in your makeup bag, if you're concerned about that. The size of the pan is perfect for your finger to dip into, which is how I apply the product first onto my cheeks and then use my brush. There is no smell to the product, either, so that's not a problem if you happen to be sensitive to fragrances. In regards to how this product performed, it did pretty well both with and without layering on top of foundation. Since I have oily skin, I usually powder my foundation to set it but decided not to when I used this product. I was noticeably oilier on those days, as I expected, but this didn't really move from where I placed it. It dries as a matte but it's not streaky or anything, it's very soft and natural looking. This really impressed me and gave me a lot of confidence to start using it more and hopefully invest in other cream cheek products, too. I definitely would love to try a different color, maybe b. real since it's described as a light pink. As a lip product, this dries more a matte (even with the moisturizing botanical ingredients) and I really need to make sure that my lips are properly exfoliated and hydrated before applying it. I don't think this is my favorite to use on my lips, but I think this might be better during a time when my lips are in a better condition. This definitely looks very coral on me, not as red toned compared to when I apply it on my cheeks, but still not anything close to mauve. Aglow Face Mist is a hydrating, lightweight mist that has nourishing botanical plant extracts and minerals to refresh and soothe skin. It includes lavender oil, prickly pear cactus extract, brown algae ("oarweed"), knotgrass extract, dandelion extract, and mineral rich water. This mist can be used as a toner, makeup setting spray, or whenever you feel the need for a refresh or light hydration. I really enjoy this mist, it makes my skin feel so soft and plump. The scent reminds me of the ocean mixed with the calming and relaxing lavender. It's a very soft, light scent. I don't necessarily like using this as a toner, as I really am picky with what I like to use in my routines, but I enjoy spraying this on my skin throughout the day when I don't wear makeup or even to prep my skin before I apply foundation. The times when my skin has felt really dry during the day, I've simply sprayed this on and it helped a lot to bring back moisture. I'm not sure if I've seen any brightening effects but my skin has felt so refreshed and soothed. This is such a lovely product and I'm so glad that lilah b. has created it, I definitely would be interested to see other skincare products added to their line. 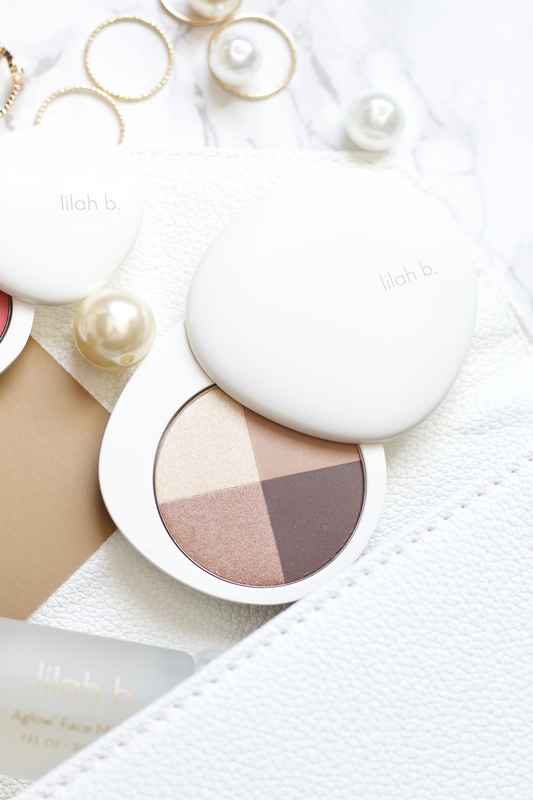 These products are honestly such high quality and I'm so in love with lilah b. as a brand. I'd love to try their foundation and cruelty-free vegan brushes next. 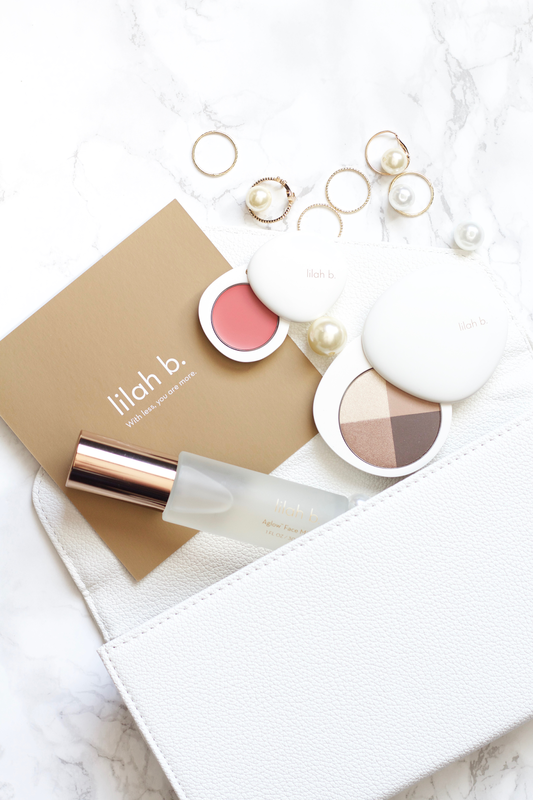 You can purchase lilah b. products on their website or at Space NK, Neiman Marcus, Barneys, and Net-A-Porter. 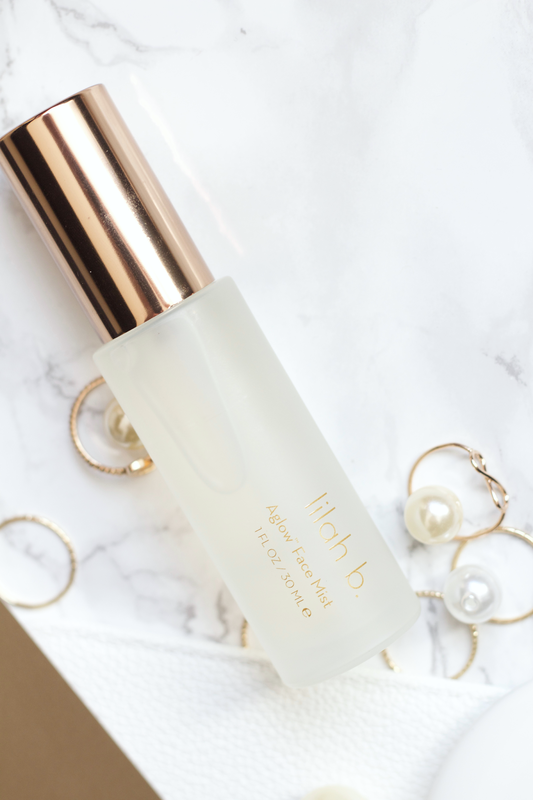 Have you tried anything from lilah b. before? Which product interests you the most?